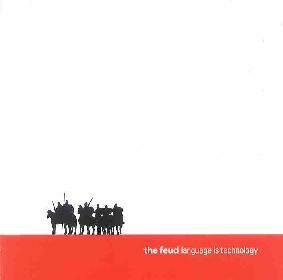 The Feud - "Language Is Technology"
The Feud say they play rock music and that seems to fit their expertise rather well. Combining a heady instrumental mix of modern rock genre influenced by everyone from Canterbury style proggisms to Sonic Youth and their jagged guitar rock soundscapes into an appealing instrumental hodgepodge of styles and variations, I find this, their second album, to contain a very quirky and intellectual approach to making rock music you hear very few other places, probably landing them well within the "post-rock" genre, a genre which seemed to rear its head in the early 90's with more "intelligent" indie and rock bands like Stereolab and Tortoise deconstructing modern pop music for a new generation, though The Feud's instrumental works seem to draw less on the German minimalism of Neu! and Can and more on quintessential English prog rock and jazz innuendo ala Matching Mole or Henry Cow. It is complex rock music without the pretensions of "art" getting in the way of it being true artistic music, keeping it a clear mile or two away from ever being labeled "art rock" as it's probably more "punk" so to speak, at least if one were to get down to the nitty gritty of things. If you were to catch someone with an orange mohawk quietly sipping away on a cup of tea and listening to Genesis's "Selling England By The Pound", this would probably be it. Buy this album and be well aware that modern rock music can exist in an artistic genre that is full of ideas and creativity you are not sure where the wall between "progrock" and "punk" died, somewhere where The Feud demonstrate a strange form of genius. Buy this album being very well aware of this. For more information you can visit the Insidious Plot Audio web site at: http://www.insidiousplot.com. Contact via snail mail c/o Insidious Plot Audio; 412 E. 11th St; Suite 2RB; New York, NY 10009.